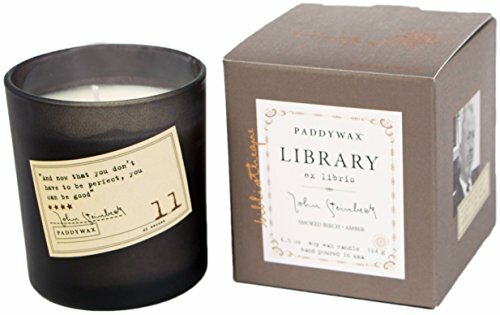 For all of the bibliophiles in our lives Paddywax presents the Library Collection. Pairing favorite quotes with exquisite fragrances, we pay homage to the literary greats. Impeccably packaged in a gift box adorned with author photo, bio and copper foil stamped labels, this is the ideal gift for lovers of fine literature. Every candle fragrance is a blend of custom notes designed to evoke the spirit of author for which it is named. Quote reads: And now that you don't have to be perfect, you can be good. The process of making Paddywax candles is artisan in every sense, closely resembling techniques used to make candles hundreds of years ago. From fragrance throw to burn time, each custom recipe is made to deliver the best experience. Our fragrance blends are developed to distribute the most natural aroma through the use of all natural ingredients. We take pride in never offering a synthetic fragrance; instead we constantly push ourselves to create something natural and unique. It begins when every candle is hand poured and ends when each product is packaged with precision. Each bow and label are applied by hand to give every product that human touch that is worthy of gift giving. We take pride in our work and know that every detail counts. Here at Paddywax we believe what is truly beautiful in life lies in the details and that is why we love what we do so much. We hope you too fall in love with Paddywax. If you have any questions about this product by Paddywax, contact us by completing and submitting the form below. If you are looking for a specif part number, please include it with your message. White Sage Spray. Smokeless Sage Smudge Spray. Energy and Space Clearing Spray. Organic Sage Bathed In Moonlight. Crystal and Reiki Energized Sage Mist.